Emirates multi-city flights from the UK to South East Asia from £426! Amazing opportunity for travelers in the United Kingdom to book very cheap Emirates 3in 1 multi-city discounted tickets and fly on board of top ranked airlines to amazing destinations in South East Asia. You can fly to Singapore and choose between Thailand. (Bangkok, Phuket) or Malaysia (Kuala Lumpur). AND Vietnam (Ho Chi Minh City) or Indonesia (Jakarta). All prices shown are for a round trip multi-city flight including all taxes and max 30kg bag in hold. 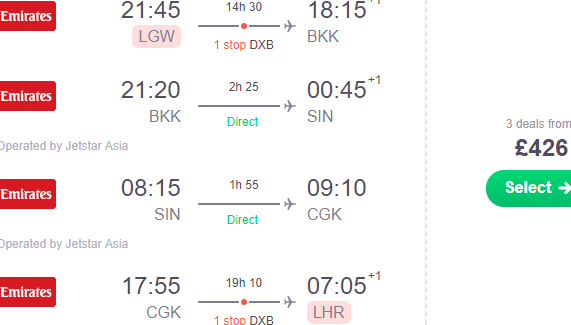 It is rarely seen Emirates to quote such a cheap multi-city flights from main airports in the UK to South East Asia also in high season. Take the advantage of this current Emirates promotion and explore 3 beautiful countries at once! You can depart from London, Manchester, Edinburgh, Birmingham, Newcastle or Glasgow! Emirates promotion is valid for flights departing from 7th of January and 31st of March or 20th of April to 11th of July 2019. Max stay 4 months. You can book Emirates promo flight deals till 28th of November or until the cheapest seats last. Need an assistance with building your itinerary you can reach us at info (at) flynous.com. Booking sample of Emirates multi-city flights from the UK to South East Asia from £426! (Thailand or Malaysia then Singapore & Indonesia or Vietnam). Travel dates as per our above travel sample itinerary. You can also book this deal directly at website of airline. In such case you can easily save some decent money with this Emirates promotion code. 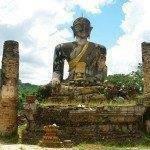 If you need cheap accommodation in South East Asia book your hotel via Booking.com or Hotels.com.